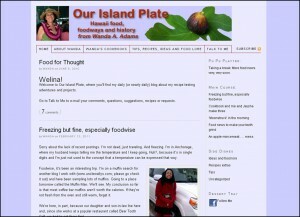 Hawaii food, foodways, and history from Wanda Adams. For years, she wrote a weekly food column for The Honolulu Advertiser, and compiled the newspaper’s 150th anniversary cookbook. She also edited “Hawaii’s Best Restaurants,” and authored “The Island Plate.” She’s now working on her fourth book, meanwhile teaching at a local community college and freelancing.